As country comedy legend Cousin Minnie Pearl used to say, “Howdee! I’m just so proud to be here!” That’s the way I feel about performing this year at Centerville, Tennessee’s Independence Day Celebration. Miss Minnie’s hometown, Grinders Switch, is a part of Centerville and it has been my pleasure to perform in this Hickman County jewel over the last few years. From playing at the Hickman County Ag Center as part of my late friend Stan Hedges’ 2008 blues concert series to more recent appearances on the Grinders Switch Radio Hour through the invitation of host Mickey Bunn, I have been getting to know Centerville and Grinders Switch. 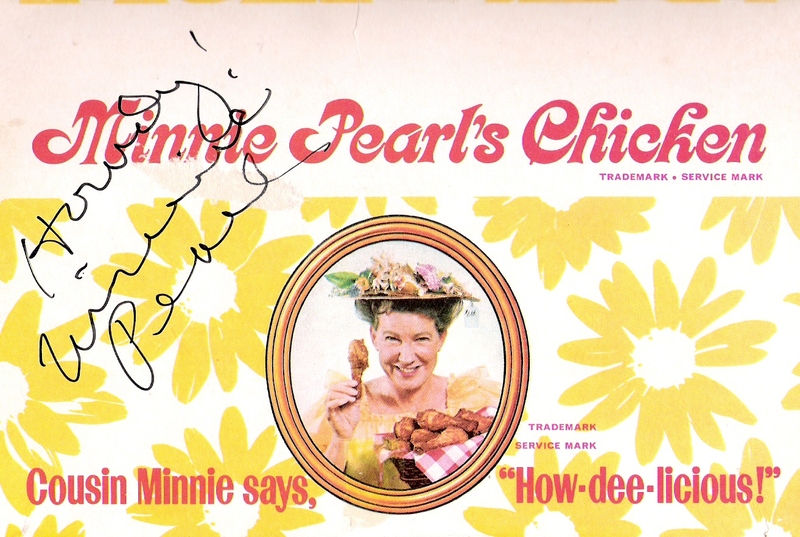 It was my pleasure to see Minnie Pearl on stage many times. The first two were at the Ryman Auditorium when it was still the full-time home of the Opry. My high school friend Phil Howell and I came to Nashville from our hometown, Pascagoula, Mississippi, to see the sights. It just occured to me as I typed that we took that trip in July, 1973, forty years ago this month. We attended the Friday and Saturday night Opry shows and Miss Minnie charmed us and the rest of the crowd as we sweated out the July heat in that then-un-air-conditioned building, cooling ourselves with funeral parlor fans. The second time was in Monticello, Mississippi when she performed at the Atwood Bluegrass Festival. As I began coming to Nashville with the intention of moving to Music City, I attended the Opry each time, as well as going to the show after I made the move. Miss Minnie never failed to entertain. I was struck by her stage presence and showmanship and have attempted to adopt the giving spirit she presented to audiences when I perform today. Miss Minnie was quoted as saying that Opry founder George D. Hay, the “Solemn Old Judge,” gave her this advice when she told him she was nervous about her first appearance on the show: “You go out there and love that audience and they’ll love you right back.” She followed that advice throughout her career. The people of Centerville have “loved me,” when I have performed there and I’ll “love ‘em right back,” as we celebrate our country’s independence together this year. It is my hope that you will have a meaningful, safe and happy Fourth of July, as well. Click photo to view Les Kerr’s online CD and download catalogue. This entry was posted in Uncategorized and tagged Centerville, comedy legend, Grand Ole Opry, grinders switch, Hickman County, Independence Day, July 4, Les Kerr, Mickey Bunn, Minnie Pearl, pascagoula mississippi, Phil Howell, Tennessee. Bookmark the permalink. 6 Responses to I’m Just so Proud to Be Here! Thanks of reminding me of Miss Minnie and tehe great times I had as a kid listening to the Opry on my Daddy John & Mama Lou’s front porch. I’m so glad I got to be there! You brought a smile to my face. Thanks so much, Kat! Glad you enjoyed this. Hi. My name is Gwanghyeon Gim. I’m a magazine reporter in South Korea who is writing about franchise history in USA. I came across Minnie peal photo while I was browsing it. I want to get permission from you to post the photo in our weekly journal in the section of introducing Minnie Pearl Fried Chicken franchise. Please let me know through my e-mail. Thank you. What is your e-mail address, Gwanghyeon?